These are also in plastic 'eye-dropper' bottles in an attractive carton featuring a colour photograph of an A6M5 Zero in flight over chips of each paint colour which are fairly close to their actual appearance, a guide with profiles (shown below) and a brief explanation of the usage of each colour with FS 595 equivalents. Inside the box is a folded leaflet showing the Vallejo paint range. Again the Vallejo colour descriptions do not fully correspond to IJN paint colour designations. This makes it more difficult to reconcile them without direct comparisons and tends to perpetuate the imprecise understanding of the colours fostered by previous hobby paint ranges. A commentary on each paint colour follows. 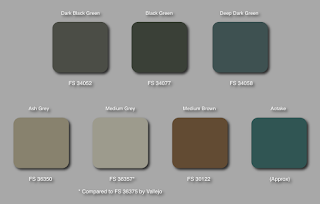 IJN Dark Black Green AV71325 - this is described as a one coat upper surface colour as applied by Mitsubishi over ash grey/medium grey or natural metal and compared to FS 34052. It is approximately similar to D1 Deep Black Green but lacks blue-green chroma and is more greyish. IJN Black Green AV71322 - this is described as representing the upper surface paint of Nakajima-built Zeros and "all kinds of aircraft of other manufacturers", being compared to FS 34077. It is greener than the FS value but duller than D2 Black Green, lacking the blue-green undertone of the original colour. IJN Deep Dark Green AV71310 - on the way into green garden shed territory with this one which is described as the upper surface paint applied by Kawanishi and Aichi, being compared to FS 34058. That FS value is the closest to Thorpe's N2 Dark Green but not that close @ 3.99 (where < 2.0 = a close match), being more vibrant and blueish. The difference is shown below. The two Vallejo Black Greens seem more typical of weathered and aged paint, described the wrong way round, with the colour attributed to Mitsubishi rather more typical of Nakajima and vice versa, although sources do differ on those assertions. The subject is explored in more detail in the AoJ IJN Greens PDF. The Vallejo colours dry matt which adds to this perception, but they do become slightly richer in appearance with a gloss coat. The Deep Dark Green is dodgy for reasons beyond the scope of this blog feature but Kawanishi Shiden and Shiden-kai colours were explored here in February and May, 2010, including interiors, but the subject is by no means as straightforward as any confidence in hobby paint sets might suggest! A Shiden colours PDF is scheduled for the AoJ Key Data colour series. IJN Ash Grey AV71311 - described as the colour for "most embarked aircraft" and in use until 1942/43 it is compared to FS 36350, therefore close to the Mitsubishi Zero early factory colour, albeit just a little darker and browner than the FS value. It lacks the olive undertone of the original paint. IJN Medium Grey AV71312 - this is compared to FS 36375 and described as used for lower and fabric surfaces. 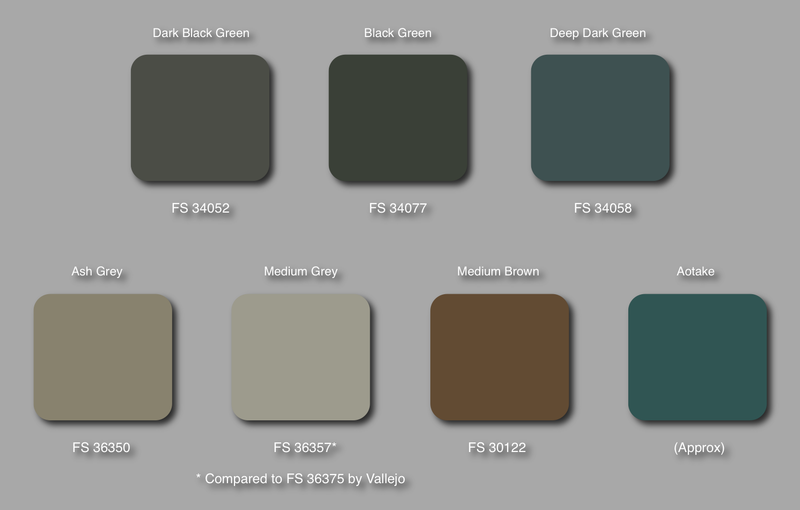 The actual paint is nothing like the FS value which is a slightly violet tinged light blue-grey but is a warmer, more neutral grey closer to FS 36357, so I suspect a typo or something lost in translation here. IJN Medium Brown AV71418 - this colour is compared to FS 30122 and is similar to many depictions of the pre-war brown applied as camouflage together with dark green to the upper surfaces of IJN aircraft, particularly in the China theatre, but surviving into the Pacific War on types such as the G4M and some floatplanes. The precise hue of this brown is still a matter of conjecture and Japanese researchers have attributed it as H2 more by deduction than proof. The Vallejo paint is a medium to dark reddish brown but not as dark as the prop colour or as reddish as the primer paint. AOTAKE Translucent Blue AV71419 - more typically blueish-green than the aotake paint included in the IJA set but still more towards green than blue. Although not compared to a FS value, it is similar to Thorpe's N17 Translucent Green. Aluminium AV71062 - this is the same colour included in the IJA set. Again something of a mixed bag. The two Black Greens both lack blue-green chroma and tend towards olive greens, which some might prefer but which are more representative of weathered and aged paints. The greys are uncontroversial unless you still believe in 'white' Zeros, but the so-called Ash Grey lacks the distinctive olive undertone of the original paint and the Medium Grey is closer to FS 36357 than FS 36307 which is associated with J3, 2-6 and the fabric dope. The Medium Brown is a catch all and will probably look good with Dark Green on the pre-war types whilst the aotake is more representative than that included in the IJA set. Colours aside, useability appears a matter of preference with some concerns expressed, but seemed to be of more interest than the colours themselves judging by the comments about the IJA set (!). This set was also purchased from Everything Airbrush (The Spraygun Company Ltd) in Poole, Dorset and is the same price as the IJA set. Image credit: All © 2017 Acrylicos Vallejo, S.L. Thanks again for these reviews Nick. Think I will be sticking with Tamiya and Gunze paints for Japanese camouflage colors. Should also mention that for Vallejo, there is a retarder and flow improver liquid that really help with drying too quickly while airbrushing. I truly like their paints, but the inability to sand after cured is a deal breaker for me as far as aircraft models. I took a chance with a purchase of this set. It seems Vallejo metallics require a black primer, the same as for Alclad II. Now on order is Vallejo's 'flow enhancer' solution. If this paint line sprays as well as it hand brushes, I will be satisfied. By hand it levels as well or better than any other paint I have used. Use of Vallejo's 'Thinned Medium' is necessary, in my limited experience with it, for that action to occur. I want to try out the AOTAKE Translucent Blue AV71419 as sprayed over the set's Aluminium AV71062, which in turn is best as sprayed over a primer. My past attempts using enamels to represent Aotake have not been very convincing. Sword 1/72 Kawasaki Ki-102 released.